Just Accept That It's Over Like the Rest of Us Have, Ron Pitts ~ The Bucky Channel - The World of Sports from Wisconsin's Perspective. Well, that will do it. The 2008 Green Bay Packers season is officially over. Sure, they still have a Monday nighter with the Bears, and the inevitable loss to Detroit, but there is really no reason to go forward at this point. I'm dealing with it ok, it just wasn't our season. It's unfortunate that some people are still blaming this whole season on the Favre situation, which shouldn't be the case. Rodgers really couldn't have played better this season, minus a couple of poorly timed interceptions at the end of some games. But on a whole, he's played just as well as Favre, if not way better. Even though I've gone over the Favre / Rodgers thing nearly a million times, I still feel like I'm required to mention something in every post. And while most people agree with me at this point, there's one thing the Favre people have over the Rodgers people. Favre's team is winning games. That's just what it comes down to at this point. The Packers aren't winning games in the season in which they traded Brett Favre, even though it has nothing to do with Brett Favre. The Packers aren't clutch this season, especially on defense. In their 20-16 loss to the Jaguars on Sunday, the Packers lost on a late drive for the third straight week. It's a script we've seen before, and maybe that's what made this week's loss so laughable. Through the entire game, it's almost as if we knew what the outcome would be. And on that final drive by the Jaguars, it seemed as if the Packers defense knew it too. They just looked like they knew they couldn't stop Jacksonville, because the situation was so familiar to them. Despite their chances at the playoffs already being slim, the defense had no problem letting the Jaguars put the final nail in the coffin. As I said, I'm dealing with this better than I thought I would. I'm just taking this season for what it is and looking forward to next year. You can't make the playoffs every season. However, I'm not so sure about how Ron Pitts, the play-by-play guy for the FOX broadcast on Sunday, is taking the loss. How many times was he trying to sell the Packers playoff chances during the game? Everyone in the world knew coming into today's game that it was near impossible for the Packers to make the postseason, everyone but Ron Pitts that is. It was almost insulting to see the graphic showing which teams were still alive for the NFC Playoffs. They kept showing the Packers as "in the hunt" for the Wild Card, even though they were already mathematically eliminated from the Wild Card. And then FOX showed what has to happen for the Packers to win the North, which would have been impossible anyway due to the fact that Tavaris Jackson is suddenly an elite quarterback. Some say this Packers season was doomed when the Packers traded Brett Favre. Others say it was after the missed field goal in Minnesota, or the blown lead against Carolina. Truth is, we've all known this season has been over for awhile, but on a pitch of grass in Jacksonville on Sunday, it became official. I admire your stiff upper lip in this horrific time, but.... Um, remember in the beginning of this glorious season when I referenced Neil O'Donnell? I was wrong, it's J.P. Losman. Never, ever will be clutch. But yes, keep blaming the defense (Who, by the way won the Detroit game for us last time). The Jags only scored 20 points and they are beyond pathetic and had quit already. Rodgers has played as well as Favre, except when it counts. That is really all that matters. You can throw stats around all day it will never take away 5-9 and now how many interceptions to seal the games? There are two rookie QB's who are more clutch right now, Rodgers is 25, dude. You are grasping at straws. It is pretty funny how stubborn we are in this state. We never like to admit, just maybe, we were wrong. I am sure I will be pilloried as usual from the usual quarters. Finally, I ask again, what would have been wrong with one more year of leadership and confidence? I guess I like winning. Because what is happening now is the sort of thing that can destroy a young QB's confidence forever. And I would think you would prefer a different scenario for your boy. This makes me feel no better than you. You do yeoman's work on this blog. The Packers defense has shown some moments of greatness, but have also let the Falcons, Titans, Panthers, Texans, and Jaguars games all slip away late in the 4th quarter of those games. Believe me.. in so many seasons I refused to blame Favre for poor seasons when other players were under-performing. The fact is, Rodger's rating this year is better than Favre's ratings for 11 of his professional years. The story of the Packer's D and our whole season this year was that the only way they can stop a team is by creating turnovers. The turnovers came in the first part of the season but when we quit getting the turnovers we began losing games. I love how bandwagaon fans say we wouldve been better off with that qb in NY this season. The prick was once again saved by his defense yesterday, which has happended in mulitple games this season. The pack defense hasn't saved us at all this season. The Detroit game doesn't count b/c they gave up 25 points before they had a couple of pick-6's. People forget the hick didn't really want to be a Packer this season. I think he's wanted out the past few seasons. He wanted to play for Minnesota and when he didn't get his way he tried to help the Lions beat us. Yes, mr. wrangler was once good...in the 90's but he's leading the league in Int's once again. I don't get how people always overlook this. If the Jets make the playoffs this season you know the old man is going to choke like he has every season since 97. Is anyone else a big Dolphins fan all of sudden? I'm appalled at some of the local journalists who are already declaring the Favre trade a mistake. Jumping the gun a little early, eh guys? I'm glad Winks brought up the point that it's Brett AND the Jets who are winning. It's not like he's single-handedly getting things done. Meanwhile the Pack can't seem to buy a win for Aaron Rodgers. What is that ... 5 or 6 losses now that have been decided by less than a touchdown? Also yeah WTF was up with putting the Packers in the "playoff scenario" at 5-8. What a joke. On a side note, I did wear an Antonio Freeman jersey this week for the game. favre sucked balls in his first couple years, and heres rodgers, doing quite well even if the wins aren't there. the thing is, favre will be gone after this year, rodgers will be around ten more years. regardless, when your starting qb is 3-7 in his last 10 playoff games, including three lambeau playoff losses, its time to get him out of town no matter who he is. thank god favre is gone. this term is not relevant at all in today's society, so let's keep it in the original farmer's almanac where it belongs. Being clutch is hard to do when every...single...time your defense goes out in the fourth quarter needing to stop one final drive, gives up the game deciding points. It's so deflating. Clearly Rodgers was forcing plays because he felt like he had to make big ones....wow that really sounds like someone else we had in GB. I certainly do not expect Rodgers to lead 5 game winning drives. While I would expect 2-3 should have happened they didn't. But it is also unfair that 5 times the defense gave up a late fourth quarter drive. If you are going to blame Rodgers for not being clutch then how the hell do you define our Defense this year? Better yet how does this defense with Favre give us success anywhere near to the degree of last year. It's Rodgers' first full year starting. A little early to be throwing him in the "never going to be clutch" catagory. Calling Rodgers "Neil O'donnell" while mildly funny when going for a comparison that makes everyone go, oh yeah remember that guy, is pretty inaccurate. And to call Rodgers JP Loseman is just stupid. 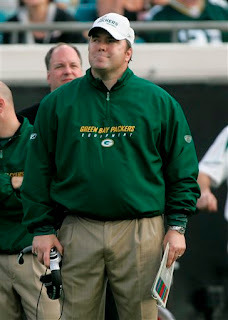 What happens after this year if the Packers never got rid of Favre. Best Case scenario we go 10-6, most likely lose in the first or second round of the playoffs. Favre has another wishy-washy offseason. Those are all debatable. One thing that isn't. Aaron Rodgers is long gone, and if Favre stays away for good, we have no quarterback. Now we are really looking at rebuilding, and with some pretty good pieces in place already. It all comes down to this offseason now. TT NEEDS to spend some cash on Jennings, and some other solid FA's. Shoring up the D and O lines with free agency and the Draft have to be priorities. Then go back to work next year. Something tells me we will all see an even more confident and much more "clutch" QB in Rodgers. Best case scenario 10-6? Don't buy into that line of thinking, Bear. This team wasn't going to make the playoffs no matter who the quarterback was. While the games have appeared similar this year when compared to last, make no mistake about it, this is not half the team that is was last year. It's about the 52 guys on the roster underperforming, not just the guy under center. I know the point you were trying to make, and it was a good post, but I don't want to see you give the Favre backers even the littlest of concessions. Honestly, how is a 10-6 season and loss in the playoff a concession. This team was 13-3 last year. If Favre was on the this team and the best they amass is 10-6 I feel like we would actually be in worse shape than we are now. What good is a short playoff run? This team is not like a team from the 80's. Those teams were inherently terrible. This team has shown flashes of being a great team and has been right there in virtually every game this year. At least this team can now grow together. Learn together from its mistakes. If we go 10-6 and Favre is our QB this year, with Rodgers leaving and an uncertain future and no QB I would be terrified of what the future holds. At least with the scenario the Packers can move on, keep a core group together and build on it. This is a core group that should be around for years with how young as a team they are and the amount of money the Packers have to spend. I in all honestly believe next year the Packers are once again a top NFC team with a little bit out of nowhere potential. If Favre was still a Packer, maybe we are in the playoff this year, but who cares, it would be another disappointment and next year and down the road would be bleak. Ha, we probably would be looking at drafting Tebow or trying to trade or sign for Derek Anderson or Matt Cassel. NO thanks. not to mention we'll be playing the third place teams from each division rather than the first. Yeoman, that was kind of funny. Winks, my name really is Antonio. B2, schedule is the stupidest thing ever to try to compare in this age. That means nothing from one year to the next. A difference of one, maybe two games on your schedule from 1st to last in the division. I know that there is no way to have this discussion with the objective way people are looking at this situation since we are referring to pricks and hicks. But I think it is pretty intellectually dishonest to somehow put this on the defense as, Winks puts in his latest post that there are two STARTERS from the defense in the Pro Bowl. I don't see any on offense. How many three and outs have occurred which leaves the defense on the field way too long which leaves them exhausted at the end of games. I don't know, I think anything over 1:30(and timeouts) should allow for at least some semblance of competence on the offensive side. I really think it would not matter, if the defense gave up a lead with 10 minutes left, you guys would still put it on the D. Because you need a scapegoat. Understandable, I guess. Bear: What is the core of the team? An aging, poor offensive line, an aging #2 receiver, a QB you cannot now, if you are honest, know if he will be ever what you are hoping for? The NFL is win now, not hope for the future. That is where the frustration comes from. You don't have years with talent to hold onto it. Windows close pretty quickly. One would think that with 13-3, one would want to capitalize on that. Yes, I was stupid and petty about the J.P. Losman comparision (running QB, drafted #21, showed flashes, not clutch, I am an idiot). Would Jeff George be better? Plenty of stats without all the wins. Last thing, I see it now. You guys are what, 24, and don't remember the 80's. You were spoiled and don't remember when players didn't want to be here and we would cream all over ourselves to win 7 games. Remember Alex Smith? Yeah, he had a good year once too, how's he doing now? Kev: yes, those idiot sportswriters whose job it is to actually, you know, make observations on the team might know more than us armchair QB's who in your case, probably never even played the game. But yes, I am sure those guys are dumb, dumb, dumb. We must clap louder!!!11!! I can't wait to read your byline any day now, right? Yes, Winks, I know where your prior career was. I just think it so funny that some thought we were not going to miss a step, somehow. Thanks for your time. Oh yeah, Btw, Jets do have a worse pass D than us. Yet here we are. Anyone who thought that Rodgers would step right in and take this team to 13-3 and a superbowl was a homer. But this team is as much of a better than 5-8 team as last years was worse than 13-3. I know, I know, wins are all that matter but you know what I'm saying. It's so funny that people with pessemistic views always seem to think they are just realists. This isn't the 80's. Teams have bad years and can come back, NFL is a parady league. Win now advocators in the Favre situation never think about next year. I guess that fine if fans think that way, but teams look for investments. Ways to make themselves good for years. I agree keeping Favre would have been a now investment, but that doesn't make it the right one. Again, with the way the defense played the last half of the season there is no way the Packers would have won the SB with Favre even. And then next year is more wishy-washiness, and next thing we know we have no QB and no direction. Your comment about the starters from the Pro Bowl being two DB's in Woodson and Collins holds zero water. Woodson has played well all year but Collins had most of his spectacular plays in the first half of the year. His first half numbers are exactly the same as now, he basically made the probowl by week 8. He needs to be more consistant. The packers were 26th in rushing defense. This team would become swiss cheese when the team has needed them the most over the last 5 or so games. I also see you expect the offense to produce with a timeout or two and 1:30 but you don't mention anything about the defense making one stop at the end of any of the last 5 games. Ha, more objectivity I guess. It wasn't just the defense though, the kick return game minus the two TD's was abhorrent, we were average on kick returns and among the worst on punt returns. Our punting was down right awful. The penalty situation this year was a joke which falls on MM for sure. The offensive line play was poor at best, with a few games of good play. Does some of it fall on Rodgers? Definitely, but not as much as you seem to have put on him. The core I was talking about is Rodgers, Jackson, Grant, Jennings, Jones, and Nelson. ON defense, Collins, Jolly, Bigby and Hawk are solid. Is hawk a bust for the 5 pick? Yes, but he is a good starter in the NFL. The Vetrans like Driver, Woodson, Harris and Jenkins are there to teach and mentor as well. That is a good group of players. Again, I said TT needs to spend our cap money on Jennings then get O and D linemen through FA and the draft. Jeff George at least makes a little more sense. But I still think your assessment of Rodgers is convoluted. Rodgers runs, but is by no means a running QB, Losman has shown the ability to throw a deep ball once in awhile but has never looked like he could be a good NFL QB. SO you really can stop with the hyperbole at anytime. Alex Smith was not good his first year. He was not even average. Infact ol' small hands looked down right awful in his first season, and did nothing in his first full season as a starter to have anyone say he looked like a good starter. There were people who predicted him to become good, but he never looked like it. Are you even looking anything up, or just saying names at this point. I'll go ahead and assume thats the case, since its highly unlikely you actually watched enough of Losman, or Smith to play to use anything but their stats. Haha, and you claim that everyone else isn't being objective. Take your anti-goggles off. Rodgers has a lot to work on but has done a good job this year. Unfortunately he didn't catch a lot of breaks and looked like a first year starter in some situations, whoa thats wierd. People said he would get hurt and hardly play, and he played through pain, and played pretty well. People said he couldn't throw while running to his left, I've seen him do that more towards the end of the year and with great accuracy. Count me in on thinking he can overcome his "clutch" issues and build on becoming a leader. I'll never understand how fans can always see the worst in every situation. Must be pretty taxing to be this kind of fan. I guess I like hoping my teams do well. My comment got eated, I think. Bear, you are correct and thanks for addressing me. I should speak more on head and less on heart. The QB comparisons are weak, on my part. I felt I was fighting a two front war(what is with my lame war comparisons?) against friends from MN and fans here. You laid it out very well to me. Thanks again guys, you do really well here and ultimately, I hope it all works out. See what happens when there is a combination of Packers in transition, Badger's sucking horribly this year, and no playoff in D1 football? I get ornery and turn into "That Guy". Haha, well arguing with minnesota fans is like beating your head into a wall. But the combination of frustrations is legit and understandable. I hate that the alma-mater looks in disarray in football. But basketball season is in full swing and hopefully they can ease the football pain in this state. to jack burton: i was just mentioning that the schedule will look a little easier next year. thats all. not a big deal, just looking for any optimism i can find. not having to play a tough afc south (even with the jags sucking) and a suddenly awesome nfc south, in addition to playing the third best teams as opposed to the first in each division, could maybe help us win a few games. so dont get so worked up about that comment.